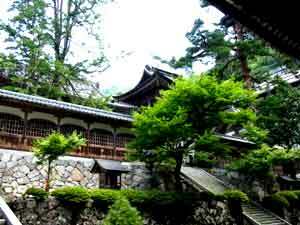 Dogen was born in 1200, in Uji, close to Kyoto. His father belonged to the Minamoto clan and was descended from emperor Murakami (947-967). During this epoch Japan was going through a time of problems. The country had recently become subject to two powers, that of the emperor and his court installed in Kyoto, and that of the shogun, a kind of supreme general who has military power, based in Kamamura. In this feudal society the big families struggle for power. The most illustrious of these were the Fujiwara and the Minamoto. His mother was the daughter of Fujiwara Motofusa, another important figure in the imperial court. Dogen lived at this time in the comfort afforded by such an influential, aristocratic family of good standing. However his father died when he was two years old and his mother died when he was eight. 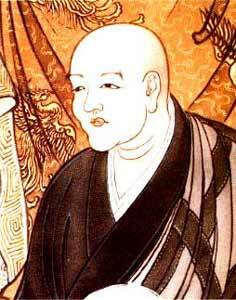 The young Dogen received an education appropriate to his standing in this world of sorrow and impermanence. Just before she died, his mother recommended to him that he should become a monk in order to help save all beings. Quickly the child, confronted by such phenomena, realised the need to search for the truth further than in the world of appearances. Orphaned, Dogen was taken care of by one of his uncles, Minamoto Michitomo, an illustrious poet who helped him discover poetry, which would subsume his future work. During his thirteenth year, he climbed Mount Hiei, near Kyoto, to the monastery of the centre of buddhist studies and enrolled in the school Tendai. His first teacher was Koen, one of the leaders of the monastery. But at this time the Tendai school was entering into a phase of decadence, placing too much importance on ceremony, mixing esoteric doctrine with exotic, developing formalism in monastic life. Moreover, soldier monks appeared on top of Mount Hiei, and the monastery seemed to be turning into a military fort. Dogen concentrated day and night on his practice, but was distracted and could not realise his aspirations. During these short years spent at the monastery, Dogen experienced great doubt. His central question was: "In buddhist teaching, all beings already posess buddha nature. If this is so, ¿Why do we have to adopt special practices to reach the state of Buddah?" Nobody could answer this question to the satisfaction of Dogen. At this time he decided to abandon Mount Hiei, as did other monks like Honen (1133-1212) and Eisai (1141-1215), founders of the Jodo and Rinzai schools, who became famous in the buddhist renewal in the japanese Middle Ages. Dogen then met master Eisai, recently returned from China, who taught Rinzai Zen: En el templo de Kennin-ji he became disciple of Myozen, the succesor to Eisai. Even though the school did not completely satisfy him , Dogen was able to practice deeply and he developed his interest for Zen practice. Erudite, and having a deep understanding of numerous buddhist texts, his demanding nature drove to search relentlessy for new teachers. He decided to go to China, to visit the source of Zen buddhism. He left Japan on the 22nd. of February 1223, accompanied by Myozen and two other monks. On his arrival, Dogen decided to stay on the boat for a while to prepare for his journey. An old monk came on board to buy japanese mushrooms. This monk, older than seventy, was tenzo (cook) in a temple in the mountain near to Shanghai. His face reflected a great depth and Dogen felt intrigued by him. He invited him to stay the night on the boat, hoping to speak with him. The monk replied that he had to return to the temple that afternoon because he had to cook. "In a great monastery like yours, Dogen said, "there must be other monks who can prepare the food?" "I'm old" replied the tenzo. "It is the practice of my old age. How can I leave to others that which I must do myself?" "Venerable monk", said Dogen, "why must an old man like you do this exhausting work instead of reading the sutras?" The monk burst into laughter and said: "Young friend from overseas, you seem to know little of the meaning of the practice and teaching of buddhism!" The old monk invited him to visit the temple of his master, and he waved goodbye. Dogen was deeply impressed by this meeting and one day, in 1225, he went to the temple at Nyojo, considered at the time to be more important than Keitoku-Ji on Mount Tendo, in Minshu. During one conversation he asked the tenzo: "What is the use of writing? How should we read the sutras? " "1-2-3-4-5", replied the old monk. Dogen asked again: "How should we study the Way, true buddhism?" - "Nowhere is the Way not true." Dogen continued: "What should we do to study the sutras, true buddhism?" "1-2-3-4-5", answered the tenzo. For Dogen this old monk incarnated true buddhism, uniting all the knowledge that he had been able to accumulate and enabling him to understand the importance of work, bodily work and all the acts of life.